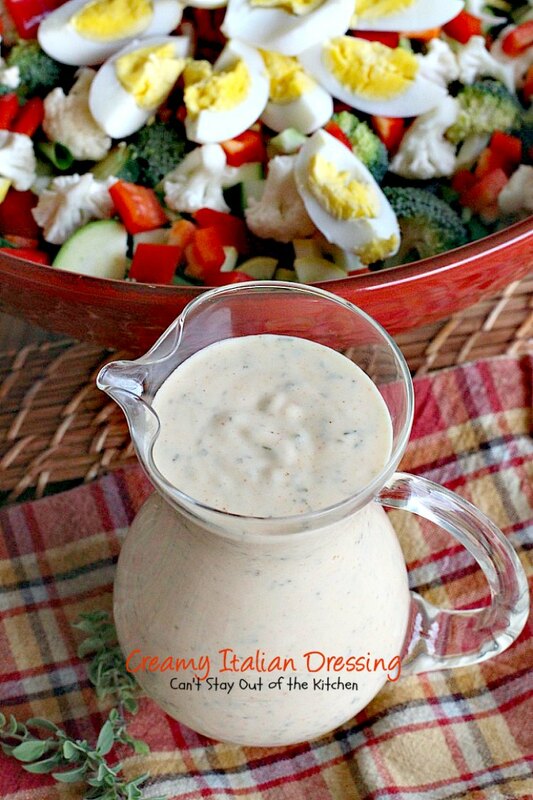 Creamy Italian Dressing is one of the B-E-S-T salad dressing recipes I’ve ever tasted! Hands down, this has always been one of our favorites. This one uses mayonnaise, evaporated milk and vinegar along with a lot of spices and seasonings. It’s the combination of seasonings that make it so special. It’s also super easy to make. I mean–like 10 minutes easy! 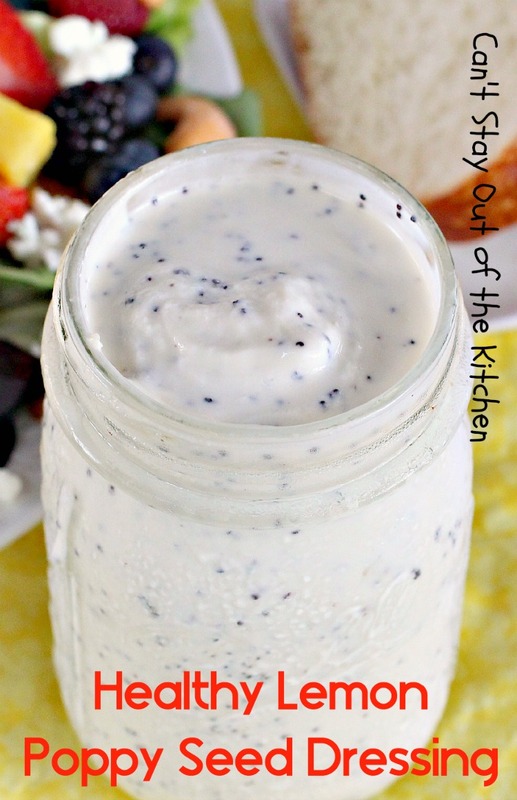 The recipe makes a quart so you can use it on a lot of salads. I’ve found it will easily keep for several weeks in the refrigerator. Creamy Italian Dressing is good on any kind of tossed salad, but I found that it’s also great with tossed salads that have fruit in them instead of the typical poppyseed dressing. 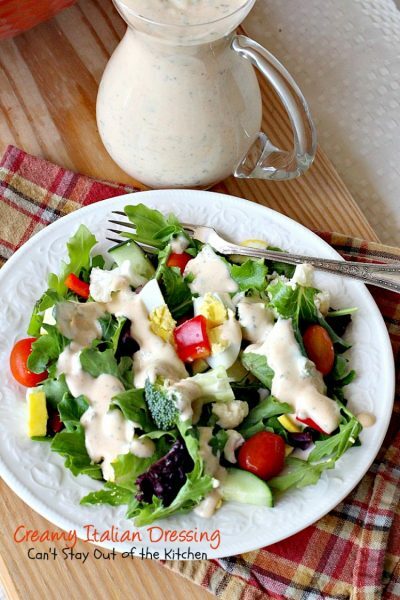 The flavor of this creamy dressing is just incredibly tasty. But because the recipe makes so much, it’s helpful if you’re feeding a crowd, or you eat salad almost every day of the week. Even if you dollop the dressing on your salad like I do, it still will make about 16 servings if you use 1/4 cup per serving. 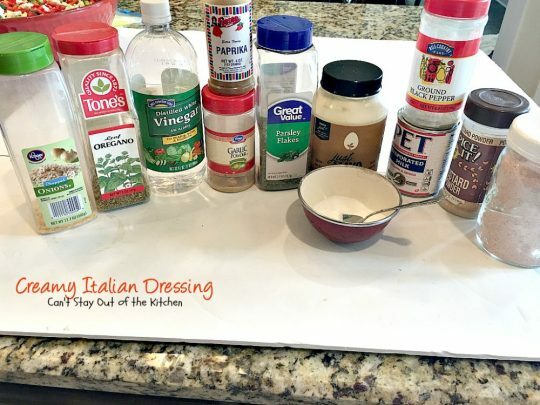 (Double that if you don’t use a lot of dressing on your salad). Years ago, when John and I were first married we used to go to a church in Largo, Florida. Every Wednesday night we would have a dinner that was prepared by a gal who was a cook for the Pinellas County school system at the time. Boy, did she ever have some great recipes. I learned to eat salad because of Pat Whitfield’s Creamy Italian Dressing. Before that, I hardly touched the stuff. I could not even consider myself a novice cook back in those days because I barely cooked at all. John did most of the cooking and when I “cooked” it was mostly to heat something up. I rarely prepared anything from scratch. That began to change after I started asking Pat and her kitchen staff for some of their great recipes. 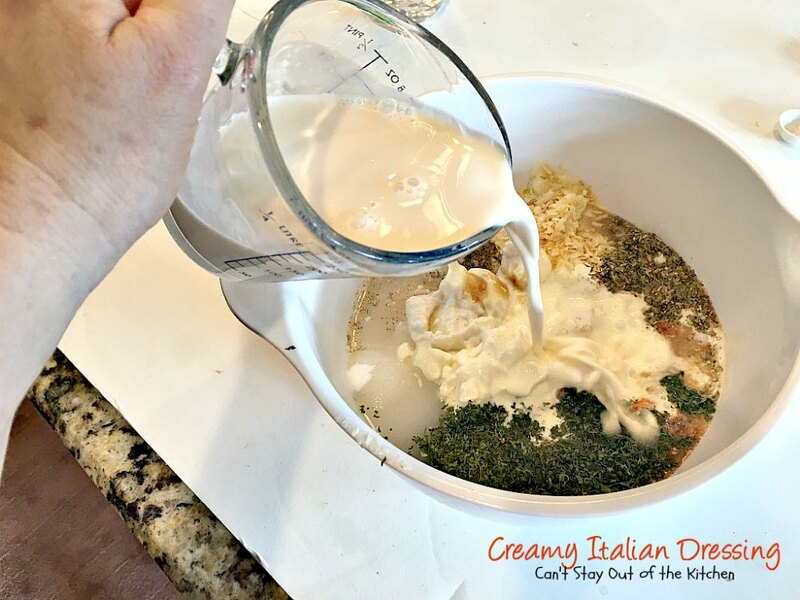 If you’re looking for a fantastic salad dressing to add pizazz to your salads, then you’ve got to try this easy, delicious, Creamy Italian Dressing. I guarantee once you taste it, you will be hard pressed to go back to bottled salad dressing. It’s just wonderful. 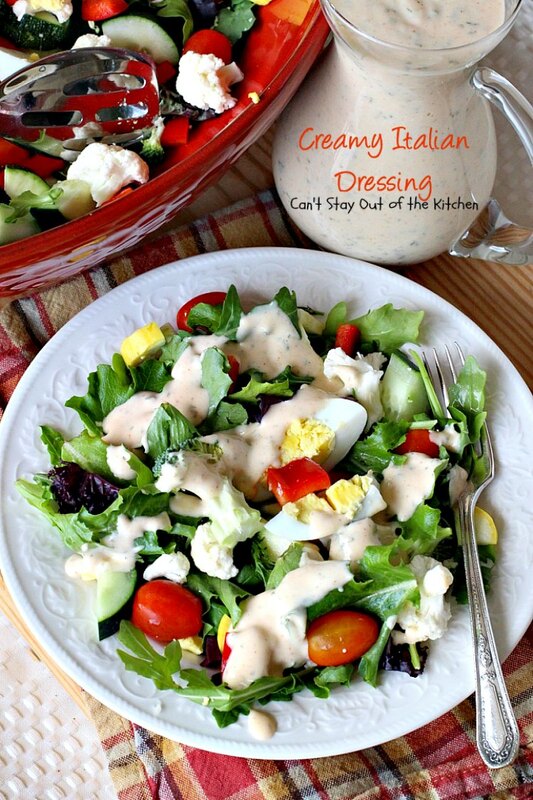 Creamy Italian Dressing is one of the best salad dressings I’ve ever tasted. 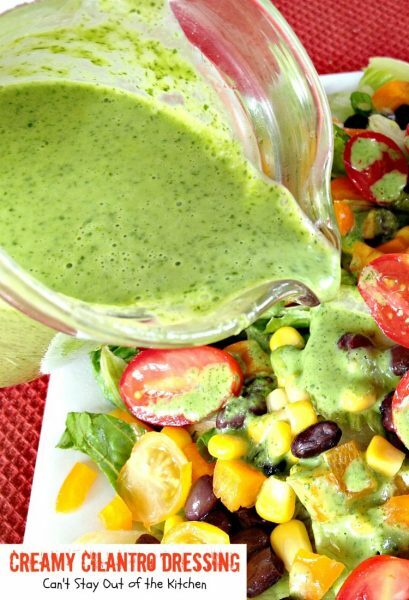 This dressing is great served on any kind of tossed salad. 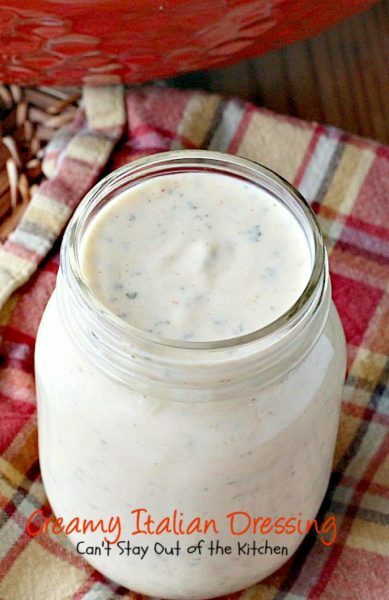 Creamy Italian Dressing will keep several weeks in the refrigerator if it’s stored well. Place mayonnaise in a mixing bowl. Add sugar, parsley, salt, pepper, paprika, dehydrated onions, garlic powder, oregano and mustard powder. Add vinegar and half of a 12-oz. can of evaporated milk. Transfer mixture to a bottle or salad dressing dispenser. 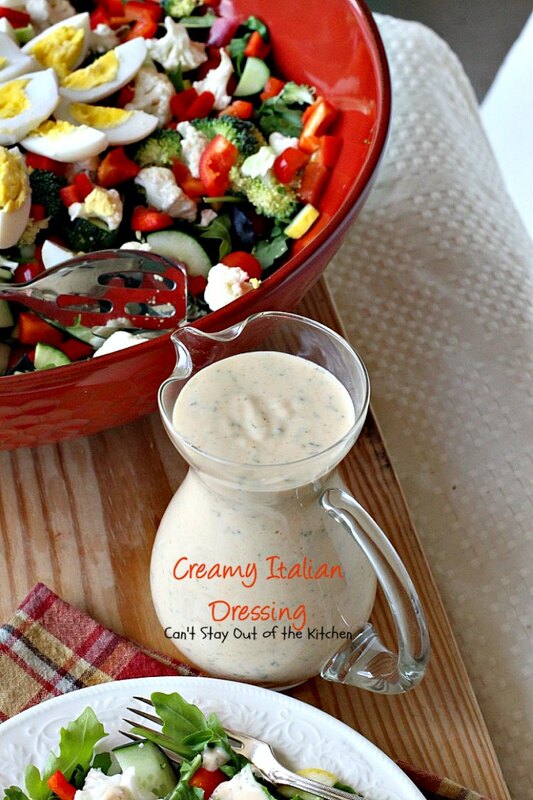 Creamy Italian Dressing makes about a quart of salad dressing. Enough for 16 one-quarter cup servings. This Creamy Italian Dressing is one of the best homemade dressings you'll ever make. 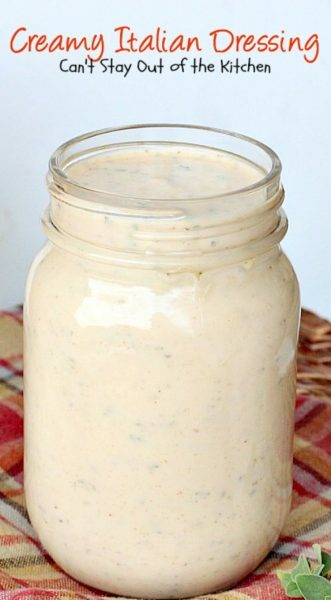 It uses mayonnaise, evaporated milk and lots of seasonings to achieve the most spectacular, tangy dressing ever. 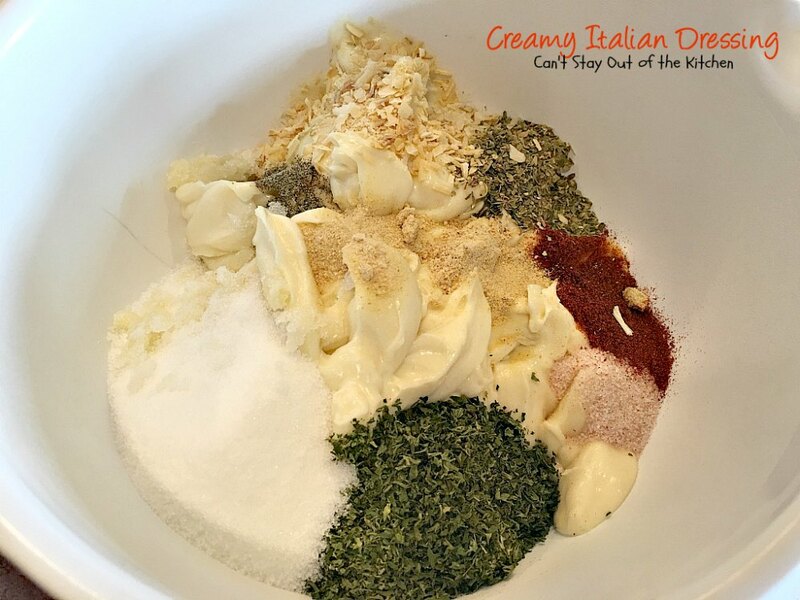 Mix together, cover tightly and let set 24 hours before serving. Put in recycled glass mayonnaise jar or qt. size mason jar and refrigerate. NOTE: You can use Miracle Whip, if desired, but mayo is better. 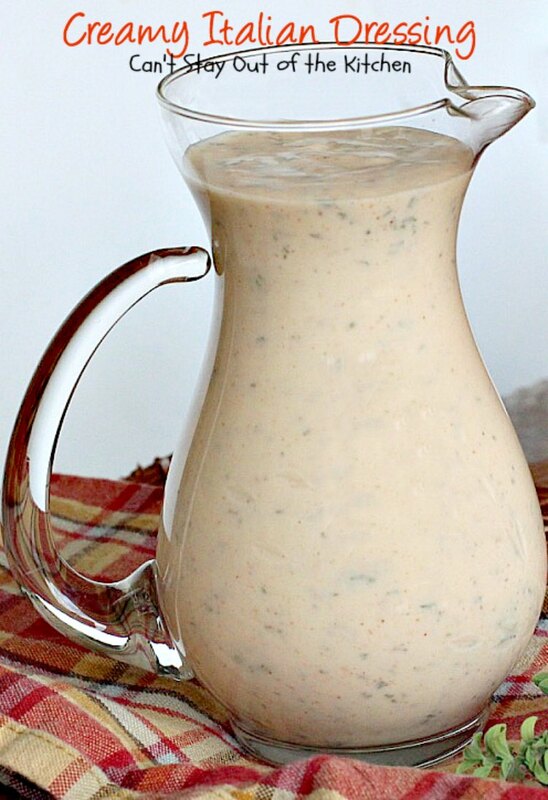 This is a great salad dressing to make if you’re taking a big salad to a potluck. 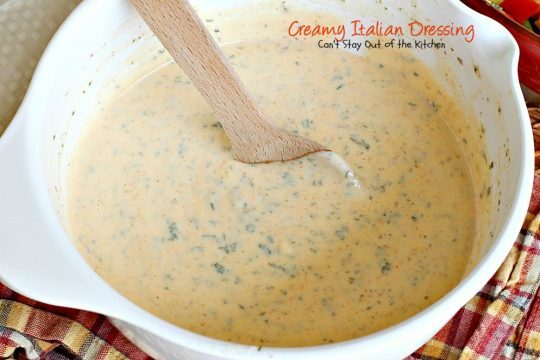 Creamy Italian Dressing is fantastic. We love this salad dressing.